Cheap - Relative to motel and hotel rooms, camping is inexpensive. 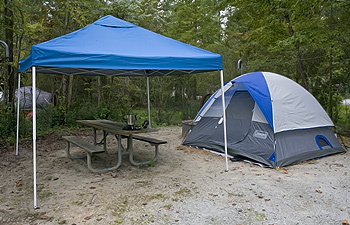 Camp sites generally range from free to approximately $20/night. In addition, food brought along for a camping trip cost much less than eating out three meals a day. With a small initial investment for equipment, one can save a substantial amount of money on travel expenses. Location - For those wishing to observe wildlife or document magnificent vistas, camping might allow you to be closer to your desired subjects, resulting in less travel time. Many times formal lodging is miles away from public lands. Camping allows one to be "on location" and get a jump start. The experience - Camping allows one to get away from traffic and construction noise, sirens, and tv. One can enjoy the serenity of katydids, crickets, cicadas, frogs, and the occasional owl or whippoorwill. Maybe you will listen to the creek serenade and fall asleep. It's nice to get away from our glass buildings, concrete and asphalt infrastructure, and work environment. Realize that developed campgrounds usually have children ... playing, riding bikes, and making noise like children do. But families usually settle down by 10:00ish. Listening to the playful laughter of kids riding their bicycles is still preferable to jackhammers and dumpster trucks. Camaraderie - Specific to groups and families, there is little that can compare to the fellowship of preparing meals, eating, and socializing, around a campfire. More Planning and Preparation - The downside of camping is that it takes much more planning and preparation than packing for a motel or hotel. 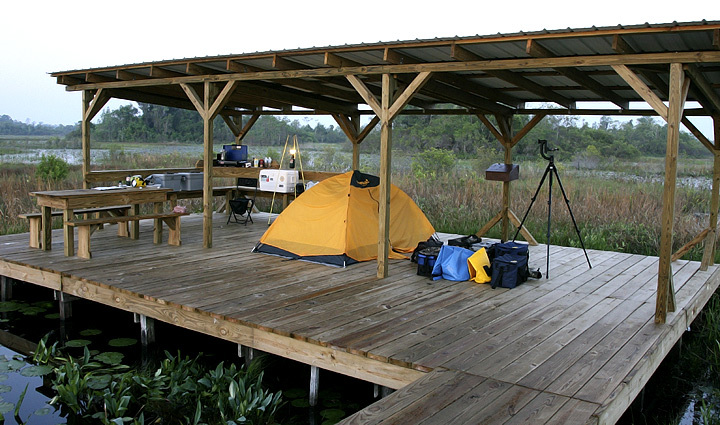 This "Camping" section of WildlifeSouth is specific to tent camping. Furthermore, it is specific to car and canoe camping. While backpacking provides a means of experiencing nature to a degree not afforded by camping from a car, backpacking is not conducive to carrying a large amount of camera equipment. Car and canoe camping allow a means of transportation of this equipment not readily available with backpacking.